Unlike mono photocopiers, colour photocopiers are able to produce coloured copies. This type of photocopier is also able to produce black and white copies too, making them incredibly versatile. These photocopies use 4 toners – Cyan (c), magenta (m), Yellow (y) and Black (k) some time referred to as CMYK printing. These photocopiers can produce a wide variety of colours on the CMYK spectrum. Over the past few decades the technology of colour photocopiers has advanced hugely, and now they are sophisticated devices that are able to carry out a wide range of tasks, helping improve office workflows. In recent years this technology has advanced further to include mobile and tablet printing, cloud storage and even more sophisticated features. Midshire has a huge range of colour photocopiers available, from leading manufacturers including:Ricoh, Sharp, Lexmark, RISO, Toshiba and HP. In general, colour photocopiers tend to cost around 20-30% more than the cost of a mono device, however as many businesses do require the ability to print in colour, it is a necessary investment. The copy costs of printing in colour is higher than that of printing in black and white, as 4 sets of toner are being used, compared to just the one. However, if certain users do not need to print in colour, software such as PaperCut and Equitrac can be installed and restrict users to only being able to print in black and white. Being multifunctional, these devices not only print, but also offer scanning, copying functionality. There are also additional features that can be added to the machine including faxing, stapling, collating, duplexing to name a few. All colour photocopiers purchased from Midshire can be placed on a Managed Print Service contract. The service contract is priced based on your usage of the photocopier (e.g. number of copies produced each month or quarter) and you pay an agreed cost per colour and black and white copy. This contract covers all the toner ordering and delivery, breakdown cover including parts and labour and regular service and maintenance from Midshire to ensure the device has a continuous high performance throughout the life of the contract. 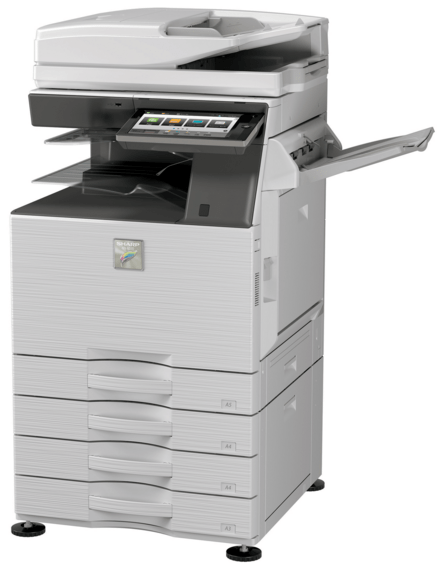 Colour multifunctional printers (MFPs) can be purchased outright or placed on a lease. Leasing is the most popular way that Midshire customers purchase their photocopiers as it spreads the cost over 3 to 5 years, with equal payments being made every month or quarter for the duration of the lease. Leasing is the most cost effective way of acquiring office technology, and often businesses find they can afford a higher specification than they initially anticipated. It also gives businesses greater flexibility to upgrade equipment at a later date and additionally there are tax benefits to leasing. Midshire has a large range of used photocopiers which are ideal for businesses that have a tight budget, such as business start-ups, non-for profits and community projects. A large proportion of our refurbished photocopiers, come from upgrading our existing customers with new devices. These machines have to go through a detailed examination before they are refurbished and made available for market. In many cases, the second-hand and refurbished machines have a far higher specification than a new photocopier of the same price, giving businesses more features and functions for a smaller budget, without being compromised by a slow or basic functioning machine.